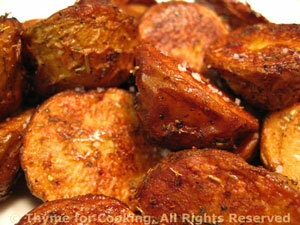 New Potato 'Oven Fries', Thyme for Cooking easy side dish. New potatoes are about the size of walnuts...(or golf balls). They are great braised or roasted whole, but get wonderfully crunchy with creamy interiors when cut in half and baked like 'Fries'.